Christmas is just around the corner! Do you already have the perfect gift idea for the people you love? In a panic to find unique Christmas gifts that’ll blow the minds of your friends and family? Here’s a fantastic selection of Nomination jewellery that’ll wow your nearest and dearest as a special gift: from the most casual to the most elegant, to be worn on special occasions. Each collection is different but is always on trend and made with high-quality materials like yellow and rose gold, silver, stainless steel and precious gemstones. Come check out our fantastic Christmas present ideas! Give the gift of Precious Moments! The perfect gift for men! Put a smile on the face of one of the most important women in your life! Each woman in your life deserves a unique Christmas present! As part of our jewellery selection, you’ll find bracelets with beautiful symbols for your wife or girlfriend, the most glamorous necklaces to give to your best friend, and the most sophisticated earrings for a Christmas gift your Mum is sure to love. Choose from among our newest jewellery collections dedicated to Her: from sparkling Extension Glitter Edition bracelets to the magical creations which make up the Wishes Collection Or create a personalised Composable bracelet with your favourite symbols, letters, and charms for a gift that’s 100% original: the new Links from the Composable Collection are perfect for sharing life’s most beautiful moments, whether they be super romantic or involve time spent with your family. Each piece is crafted according to prestigious Florentine goldsmith traditions, which preserves a level of quality that only Made in Italy can guarantee. Looking for the perfect Christmas present for your boyfriend or husband? Need an idea for a unique gift for Dad? This Christmas we’ve chosen only the best men’s jewellery for a gift that’ll make him truly happy: high-quality accessories made with precious materials such as stainless steel, gold, silver and leather, which are perfect for every occasion. 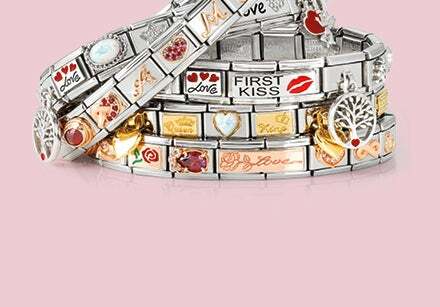 Personalise a Composable bracelet to give to your boyfriend: write a special message using gold letters, or choose symbols which tell your love story. Looking for a classic gift for Dad? Pick out a watch from the Time Collection: there’s a model for every style, from the most traditional with a stainless steel wristband, to the most casual, with a strap in silicone or coloured fabric. Want more ideas for how to wow your friends and family with an original gift? Discover all our Men’s jewellery and find the perfect present for Christmas 2019! Unique Christmas presents are exactly what you need to wish everyone the very best. When we find personalised jewellery created just for us under the tree, we’re filled with joy because it shows just how much we’re loved! Our Trendsetter bracelets in steel, also available in the colours black and grey, are dedicated to Him. For her, on the other hand, engrave your message onto a Composable Link. 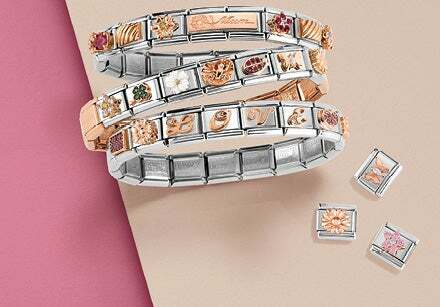 Single, double, or with a hanging charm, you can choose between yellow gold, rose gold, or silver as the base material for your engraving, and add a special tile to your personalised bracelet.